It’s any young researcher’s dream — a conference filled with Nobel Laureates in chemistry, medicine, and physics who are ready to offer advice and motivation on how to solve the world’s most pressing problems. For Patrick Ryan, a fourth-year chemical and biological engineering graduate student at the McCormick School of Engineering and Applied Science, attending the 2010 meeting of Nobel Laureates in Chemistry, Physiology or Medicine and in Physics from June 27 — July 2 in Lindau, Germany was a chance to learn from the best, and take their lessons back to his work. The annual meeting brings together laureates and young researchers from around the world for lectures, seminars, discussions and events aimed at educating, inspiring and connecting future generations of scientists. Ryan was one of nearly 700 students from across the globe who attended; he was chosen by his department to be a Department of Energy-funded nominee and was ultimately selected by a national committee. Ryan spent his mornings hearing presentations from laureates — on everything from cosmic radiation (in which the panel patched in a live feed from CERN, where researchers reported on results they had just received that morning) to the need for community involvement in medicine — and many of the laureates said that their prize-winning research was serendipitous: that they started an experiment without any preconception of how it might turn out, without knowing that their results would have global implications, but that they trusted the scientific process and were pushed by their own imaginations. The themes of the meeting matched those that McCormick emphasizes, Ryan said — the importance of imagination and interdisciplinary collaboration in a global context. Presenters urged the young researchers to use these themes to think about the world’s most pressing problems, including global health, food, and energy. The feeling of the panels was optimistic, Ryan said — if there were no political or technological barriers, the entire world could ultimately be fed using only one-third of the farmland, one researcher reported. Ryan attended a brainstorming session where researchers thought about what will happen when all the coal is gone from the planet. Before going to the conference, Ryan met up with the other federal government-funded researchers in Washington, D.C. Being able to talk with researchers outside a lab or meeting allowed Ryan to hear the stories about their work and how they became scientists — and to establish connections between his own work in chemical engineering and the work of those in different fields. Ultimately, Ryan hopes to take the final message from the conference — to not assume results, trust the scientific process, and be hopeful about what’s possible — back to his own research in the computational study of oxidation catalysis. 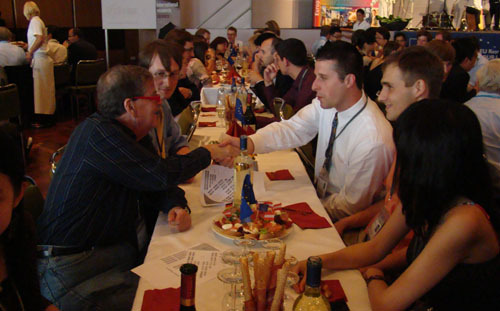 Top: Patrick Ryan introduces himself to Aaron Ciechanover, who won the Nobel Prize in Chemistry in 2004 for the discovery of ubiquitin, which degrades proteins within the cell. The two shared deep conversations about the ethics of medicine and the importance of collaboration in research environments. 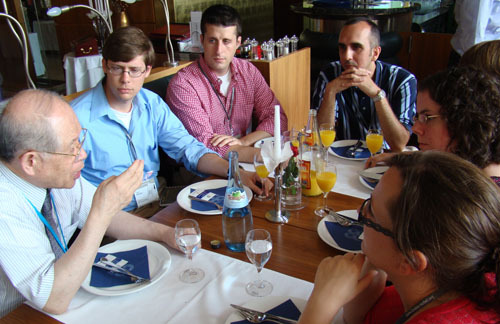 Bottom: Patrick Ryan and other young researchers from the United States listen to Ryoji Noyori, who won the Nobel Prize in Chemistry in 2001 for his work in asymmetric catalysis. Noyori specifically mentioned curiosity and determination as important qualities of good scientists.